Which of these historic aces wore the undisputed MLB crown? Click here for Part 1 and the methodology. 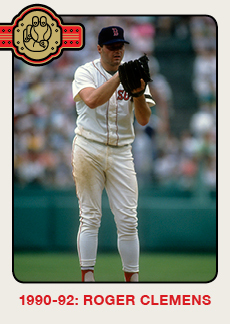 We kick off the ’90s with Clemens’s best season as a Red Sox pitcher. After posting a 3.13 ERA and failing to make the All-Star team in 1989, Clemens bounced back in a big way, going 21-6 with a sumptuous 1.93 ERA in 228.1 IP. In August alone, he went 6-0 while allowing just six runs in six starts. 666?!? Does this mean Clemens is the Antichrist?! 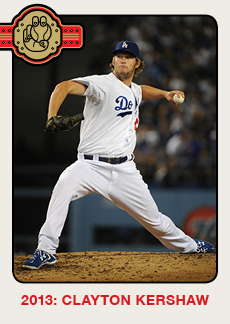 ?1 He posted a 0.97 ERA altogether in the second half, but that somehow wasn’t enough to win him the Cy Young Award. Well-respected veteran Bob Welch, who died last month, went 27-6 with a 2.95 ERA in 1990 to claim his first and only Cy Young crown. Clemens, having produced 10.6 bWAR to Welch’s 3.0, finished second. Clemens would finish second to no one in 1991. He led the American League in ERA (2.62), strikeouts (241), and innings pitched (271.1), winning 21 of 28 Cy Young first-place votes. (The other seven first-place votes were split among three Twins pitchers, which is not something you say every day.) Clemens would lead the American League in ERA (2.41) for a third consecutive season in 1992, but his 18-11 record was only enough to get him to third in the Cy Young balloting. Dennis Eckersley and Jack McDowell finished ahead of him despite combining for fewer bWAR (8.2) than what Clemens produced on his own (8.8). The burly Texan would never be the same again in a Boston uniform; he posted a 4.46 ERA in 1993, and after throwing 225 innings or more in each of his first seven seasons, he failed to do so again until 1996 — his final year with the organization. Let’s check back in with him later. Looking back, the strange thing about Maddux is that it all kinda came out of nowhere. He posted solid ERAs in the minors after being drafted out of high school in the second round, but strikeout and walk rates are usually better indicators of professional success, and his ranged from mediocre to middling. In his last season spent primarily as a minor leaguer, 1986, Maddux threw 192 innings across Double-A and Triple-A and struck out just 100 batters while walking 45. He posted a 5.52 ERA in 31 innings for the Cubs as a 20-year-old September call-up that season, and he went 6-14 with a 5.61 ERA at age 21 for the North Siders a year later. And then … he posted a 114 ERA+ in 249 innings, made the All-Star team, and was a five-win player on average (by bWAR) over the subsequent 21 seasons. 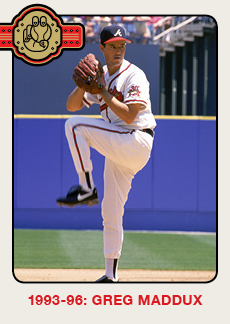 Maddux was not the runaway favorite to win the Cy Young Award in 1992, but he did anyway, by posting a 2.18 ERA. There was no question about his standing after he signed with the Braves as a free agent that offseason. He would win Cy Young Awards in each of his first three seasons with the team. Put it this way: There have been seven seasons in MLB history when a pitcher who qualified for the ERA award posted an ERA+ of 250 or better. Nobody has more than one … except for Maddux, who pulled the feat off in consecutive seasons (1994 and 1995). He wasn’t quite as good in 1996, with John Smoltz winning the Cy Young and Kevin Brown posting a 1.89 ERA, but Maddux was still well above average and had been so dominant over the previous three seasons that I can’t imagine anybody picking against him at the end of ’96. Oh, and there is that iconic commercial, too. At the end of 1997, though? You might have a case. Maddux was still very impressive, leading the league in winning percentage in 1997 and the NL in ERA in 1998. Other pitchers just raised their game. 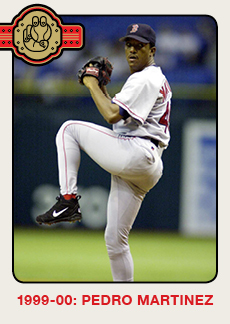 Pedro Martinez claimed his first Cy Young in 1997, thanks to a 1.90 ERA over 241.1 innings with the Expos. The AL Cy Young winner, though, was a rejuvenated Clemens. Now in Toronto, Clemens delivered on his four-year, $40 million contract with a 11.9 bWAR season, leading the AL in wins (21), innings pitched (264), strikeouts (292), and ERA (2.05). Park and league adjustments actually leave him with a better ERA+ than Martinez. It’s safe to say these two seasons were penciled in from about the first moment this project was considered. If anything, we underrate Martinez’s peak because it was the opposite of the Koufax peak; it came in a hitter’s park during the height of the steroid era. Translate his 2000 line to the 1963 Dodgers and Martinez would have gone 19-5 with a 1.00 ERA. The real problem is picking which of the two seasons is better. 2000 is generally considered superior, because Martinez’s ERA fell from 2.07 to 1.74; his 291 ERA+ is the best season from any starter since 1880. On the other hand, he was also a much luckier pitcher in 2000; Martinez posted a .237 BABIP that year after an out-of-character .325 BABIP the previous season.2 FIP regresses that figure toward league average and credits Martinez with a 1.39 FIP in 1999, the second-best FIP in the history of baseball.3 Martinez was more productive in 2000, but in terms of the things he could control, he might very well have been a better pitcher in 1999. In either case, we’re splitting hairs; it’s almost surely the best two-season stretch by any pitcher in the history of baseball. I’ll spoil it for you: Martinez doesn’t appear on this list again. It seems impossible, but it’s true. He was injured and started only 18 times in 2001, and while he was very good when he did make it onto the mound, the 2.39 ERA he posted didn’t match the heights of 1999 and 2000. He led the American League in ERA in 2002 (2.26) and 2003 (2.22), but failed to reach 200 innings in either season and didn’t win the Cy Young. Martinez was great for a few more seasons, but he was never again the best. Johnson won the NL Cy Young during both of Martinez’s memorable seasons in the American League, so when Martinez slipped because of injury, it was always going to be Johnson’s title to lose. He didn’t. Johnson went 45-11 over this two-year run, winning two more Cy Young Awards to make it four straight.4 He famously led the Diamondbacks to a World Series win in 2001 by winning five games in the postseason, including Game 7 of the World Series with four outs of relief on zero days’ rest. And the second-best pitcher in baseball over those two years was probably Curt Schilling, Johnson’s teammate in Arizona. Johnson was injured and missed most of 2003, and after an impressive 2004, he was traded to the Yankees in a deal that didn’t really work out for either side. While he probably could have carried on into his fifties as a terrifying LOOGY, he retired in 2009 and became a photographer, which is awfully cool. He’s most recently been documenting his trip to Southeast Asia on Twitter. For the first time since 1983, there’s no obvious candidate to fill the open position of Best Pitcher Alive. Johnson is hurt. Schilling missed a month and a half and threw only 168 innings. Martinez missed a month and threw only 186.2 innings. Mark Prior is a viable candidate, given that he finishes the 2003 season having thrown 328 innings of 2.74 ERA baseball over two seasons with the Cubs; little did we know at the time that he had only 329 innings of professional baseball left to go. The best combination of track record and recent production, though, is Halladay. 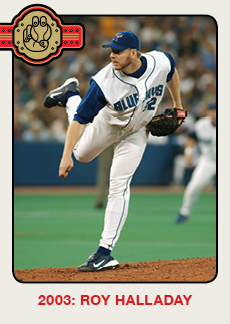 After badly flaming out during 2000 and being sent to rebuild his confidence and career in High-A Dunedin, Halladay returned to the majors a much more efficient and effective pitcher, cutting his walk rate dramatically while working longer into games. He was impressive in a half season in 2001 and made the All-Star team in a 19-7 campaign in 2002 before throwing 266 innings in 2003, an innings total that is totally anachronistic considering the era and Halladay’s age (26) at the time. He went 22-7 with nine complete games, struck out a league-high 6.38 batters for every one he walked, and finished fifth in the AL in ERA. As an ace seemingly transported from another time, he won 26 of 28 Cy Young votes. Unfortunately, in 2004, Halladay got hurt and pitched only 133 innings of relatively ineffective baseball. He’d be back in the running for this award, though, in 2005 and beyond. Santana was one of the causes célèbres of the then-nascent baseball blogosphere, having been preceded by the likes of Jackie Rexrode, Erubiel Durazo, and Roberto Petagine. A Rule 5 pick out of the Astros organization in 1999, Santana stuck on the Minnesota roster as a long reliever and spot starter. By 2002, he was on the roster for good with a killer changeup in tow; he struck out 10.3 batters per nine innings and posted a 3.04 ERA across 266.2 innings in a swing role, eventually moving into the starting rotation by the end of 2003. 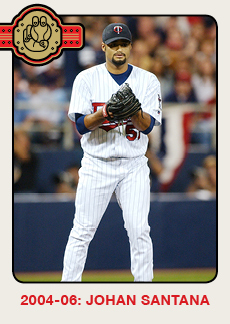 2004 was his first full year as a starter, and Santana immediately turned into a staff ace: He went 20-6 while leading the American League in strikeouts (265) and ERA (2.61). He slipped a teeny bit in 2005, finishing up 16-7 with a 2.87 ERA, but Santana still managed to lead the AL in strikeouts and ERA+, and the Cy Young Award winners (Bartolo Colon and Chris Carpenter) weren’t really as good as Santana at this point. Clemens was brilliant in a 211-inning stint for the Astros after winning the Cy Young in 2004, so he’s probably the closest to Santana in 2005, but I feel like Santana pitched well enough to hold the belt. And then, in 2006, Santana was the best pitcher in the majors. He led the majors in ERA (2.77) and strikeouts (245), and was tied for the league lead in wins (19). Santana would post a 3.33 ERA in his final year with the Twins before his ill-fated trade to the Mets, which begat one very good season and two good seasons. He wasn’t really in consideration again for the belt. Two candidates sneak ahead of Santana in 2007. In the National League, there’s the strong case for Padres ace Jake Peavy, who won all 32 first-place Cy Young Award votes in a season when he led all NL hurlers in wins (19), ERA (an MLB-best 2.54 and the only starter with an ERA under 3.00), and strikeouts (240). Even after accounting for the pitcher-friendly effects of Petco Park, he posted a league-best ERA+ of 158. 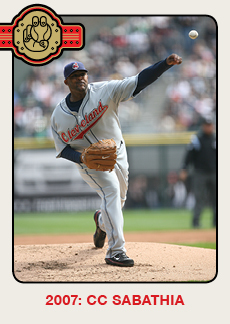 Peavy’s case is strong, but I found myself leaning toward Cleveland’s CC Sabathia. (Big respect big.) Sabathia’s Cy Young win wasn’t unanimous, but he did claim 19 of 28 first-place votes and delivered a season almost as impressive as Peavy’s, going 19-7 with a 3.21 ERA while leading the league in innings pitched (241) and K/BB ratio (5.65!). It was also the culmination of a multiyear run for Sabathia as an improving pitcher; he’d posted a 139 ERA+ the year before, while Peavy was at a 99 ERA+ in what had been a disappointing campaign. My opinion — and, admittedly, my memories at the time from 2007 — have Sabathia just ahead of Peavy. Sabathia would have a strange 2008. Entering a contract year, he started 3-8 for an underperforming Indians team that eventually traded him to Milwaukee for a package built around slugger Matt LaPorta. Sabathia put together the best half season imaginable for the Brewers, going 11-2 with a 1.65 ERA for a team that needed every one of those starts to win the wild card, before signing with the Yankees during the offseason. In all, he actually improved on his numbers from 2008, throwing 253 innings with a 2.70 ERA across both leagues. He just couldn’t keep up with a phenomenon. Somewhere between Mark Fidrych and Martinez was Lincecum, whose mechanics heading into the league were downright controversial despite his consistent success. 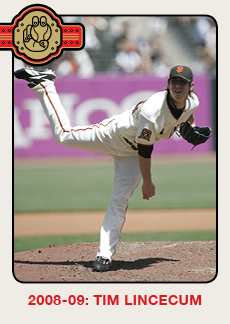 The Sports Illustrated story on him during that breakout 2008 campaign had the right line: “looks 18, throws 98.” 2008 was his first full season in the majors, but Lincecum was already baseball’s most unhittable starter. He struck out 265 batters during a season when no other pitcher made it above 206. He allowed fewer homers (0.4) and hits per nine innings (7.2) than anybody else in baseball. Lincecum was second in wins (18) and ERA (2.62) with little help from a bad Giants team; San Francisco’s other pitchers were a combined 54-85. He easily won the Cy Young Award, repeating the feat the following year with a virtually identical 2009 campaign. After toiling in obscurity for a series of disappointing and/or irrelevant Blue Jays teams, Halladay was finally traded to a winning squad during the 2009 offseason, as the Phillies sent three prospects6 to the Jays to acquire their new ace. Halladay had finished in the top five of the AL Cy Young vote in each of the previous four seasons, averaging a 17-8 record with 233 innings pitched and a 3.11 ERA for the Blue Jays, and he had an even more impressive season in the heat of a meaningful race in 2010. Halladay led baseball with 21 wins and 250.2 innings pitched, and he was third in ERA (2.44) while striking out 7.3 batters for every one he walked. No other starter even hit four strikeouts per walk in 2010. Throw in a perfect game in May and it’s no surprise Halladay was a unanimous Cy Young choice in his first National League season, even before a postseason no-hitter in October. Halladay was just as good in 2011; there were no perfect games or no-hitters, but he went 19-6 with a 2.35 ERA, leading the NL in ERA+ (163) and FIP (2.20). It seems incredible to think he was that good as recently as 2011, given that he’s now retired after two years of injuries and ineffectiveness. I wouldn’t blame you for saying that Halladay should have kept the Best Pitcher Alive title for one more season, but I think a superior pitcher emerged in his AL absence. Speaking of ineffectiveness! Sorry. You already know that Verlander has been a mess this season, but he was the league’s best pitcher during that 2011-12 run. 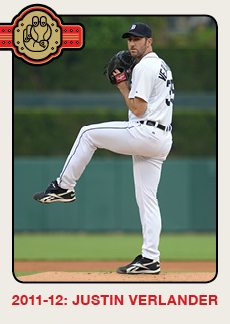 The 2011 season stands out as the better of the two for all the black ink, as Verlander won both the Cy Young and MVP awards by leading the American League in wins (24), ERA (2.40), innings pitched (251), and strikeouts (250). He narrowly missed out on taking the Cy Young for a second consecutive season in 2012 as part of the sabermetric blood war that was David Price vs. Verlander, but even if you think Price was better in 2012, Verlander’s performance over the previous few seasons should certainly be enough to keep him from losing the belt. R.A. Dickey won the NL Cy Young in 2012, and while his was an inspirational one, I’m pretty sure Dickey would choose Verlander over Dickey for the Best Pitcher Alive title. When Verlander slipped even a tiny bit in 2013, though, the Los Angeles lefty was around to procure the title. I’m hoping I don’t need to remind you too much of what Kershaw did last year, and given that he just posted the second-best nine-inning game score in baseball history (102) in June 18’s no-hitter of the Rockies, I don’t think very many people would argue against Kershaw retaining the title of Best Pitcher Alive in 2014. About 80 percent of the feedback to a list like this is inevitably something like “No [very good player who came up narrowly short of being listed]?” The rude-but-efficient way to answer these questions is “No.” In the interest of getting ahead of those debates without being rude, let me address a few of them here. No Juan Marichal? Unfortunately for the legendary Dominican hurler, Marichal’s peak came in just as Sandy Koufax had the lightbulb go off in Southern California. Marichal had a very reasonable shot at claiming the title in 1967 after Koufax’s retirement, but he put on his worst performance in years, going 14-10 with a 2.76 ERA (121 ERA+), mostly due to a second-half collapse. Bob Gibson was in another universe in 1968, and Tom Seaver’s success in the pennant race keeps him above Marichal in 1969, the San Francisco ace’s last great season. No Whitey Ford? It’s hard to really say that people saw Ford as one of the best pitchers in baseball very frequently for much of his career. He received Cy Young attention only in 1956 (when he finished third to NL MVP Don Newcombe) and 1961, when he won with that 25-4 season we talked about in Part 1. I wouldn’t fault you for picking Ford in either of those seasons. His best season in terms of bWAR was actually 1964 (6.7), but that came during the heyday of Koufax. No Nolan Ryan? No, and to be honest, I don’t think there’s a season where he’s really close. Ryan was obviously an incredible strikeout pitcher, but much of his value comes from his longevity and ability to pitch in front of any defense by avoiding balls in play. Ryan never won a Cy Young and really came close only once, when he was beat out by Jim Palmer in 1973. He’d finish third in the Best Pitcher Alive race behind Seaver and Palmer back then. Ryan led his league in strikeouts 11 times, but he had only two 20-win seasons, never led the league in wins, and won the ERA title only twice. Once was in the strike-shortened 1981 campaign, and the other was in an 8-16 season for the Astros at age 40 in 1987. Ryan was a very good pitcher for a long time, and he might very well have been the Best Pitcher Alive on the days when he threw those seven no-hitters; it’s no slight on his career that he simply wouldn’t ever have been considered the Best Pitcher Alive for a full season. Toughest Pitcher Alive might be another story altogether. No Don Sutton? Even more so than Ryan, Sutton was good for a long time without really ever being great. He had a five-year stretch with five consecutive top-five Cy Young appearances, but Sutton captured only two first-place votes over that time frame; he was never close to actually winning. He made four All-Star teams in six years over that stretch and zero All-Star teams in his other 17 seasons. No Phil Niekro? Niekro has the most career bWAR (97.4) of any 20th- or 21st-century pitcher without appearing once on this list. My impression, even living in Boston during the heyday of Tim Wakefield, is that the general public takes knuckleballers and their success far less seriously than similar performances from any other pitcher. I don’t think Niekro would have ever received serious support as the Best Pitcher Alive for that reason, even if his numbers were certainly impressive enough at times to justify such support. No Old Hoss Radbourn? Yes, I could have chosen to start this entirely arbitrary exercise in the 1880s to ensure that Radbourn would both appear on this list and then advertise it to his many Twitter followers. Round numbers, though, are more satisfying than even the tastiest bit.ly traffic. Sorry, Hoss. OK, fine. Many of the same arguments used against Morris’s Hall of Fame candidacy apply here, too. Morris never won a Cy Young Award (or even finished second), so it’s very difficult to say there was a season when he was ever considered the Best Pitcher Alive. He consistently won games during the ’80s, which is worth something, but his best stretch was probably 1981-83, when he finished third in the Cy Young voting twice in three years during a period when Steve Carlton was winning multiple Cys. 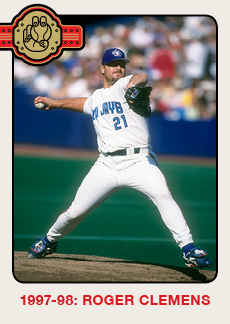 When Morris had that two-year run as the grizzly veteran for the Twins and Blue Jays in the early ’90s, it was coming after two seasons with ERAs of 4.86 and 4.51 with Detroit, amid a stretch when Clemens was leading the AL in most major categories on an annual basis. No Tom Glavine? Glavine won his first Cy Young on the worst-to-first Braves in 1991 after four below-average professional seasons; it was a stunning turnaround, but it would be like giving Dallas Keuchel the Best Pitcher Alive award this season. He has to do more to prove that he’s going to stay at that level. By the time Glavine had shown that, Maddux had surpassed him. He had a second Cy Young season in 1998, but Clemens and Maddux were better on an annual basis, and Martinez had exhibited a higher peak over the previous two and three seasons than Glavine, even considering 1998. No Felix Hernandez? Hernandez might be the best pitcher on the planet right now; I certainly think he would be in line to take the title if Kershaw suffered a serious injury. Part of what makes Hernandez so impressive is that he was pretty good in the majors at such a young age, but he wasn’t really great until 2009, when he cut his ERA by nearly a full run and led the AL in wins. I don’t think it was enough to take the title belt away from Lincecum, who was more dominant at the time. 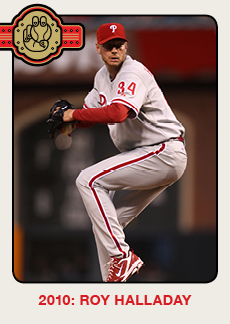 Hernandez won the Cy Young in 2010 with an even more impressive season, and I certainly wouldn’t blame you if you chose to pick him as the Best Pitcher Alive at that point over Halladay. In either case, Hernandez had an ordinary (for him) season in 2011, which would have sent the title to either Halladay or Verlander, and Kershaw’s been better since. There’s no shame in being the second-best pitcher in baseball. And, finally, let’s note those pitchers who stand out even among these truly impressive brethren. Warren Spahn and Clemens are tied for the most seasons as the Best Pitcher Alive, having held the title for a total of seven years each. Clemens is the only pitcher to hold the title for three separate stints. Carlton had the longest gap, with eight years between Best Pitcher Alive reigns. Three pitchers held the award for five consecutive seasons: Spahn, Robin Roberts, and Lefty Grove. Dwight Gooden, who claimed the title in his age-19 season, was the youngest claimant to the throne. A 40-year-old Spahn was the oldest. So, who was the Best Best Pitcher Alive? After nearly 10,000 words, I’m still not really sure. There’s a brigade that will say Koufax, and if you can’t fault a pitcher for his times, they’re probably not wrong. I’m inclined to say Martinez burned brightest, but is what he did really better than the staggering longevity at the top of somebody like Spahn? Is it even realistic to compare the gobs of innings amassed by the likes of Christy Mathewson to the carefully managed workload of Clayton Kershaw? I’m not sure. But hey, while we’re not sure, let’s have fun arguing on the Internet about it. Editor’s note: Bill, you’re already hired. Don’t worry about it. His career BABIP before those seasons was .276; in the seasons after 2000, it was .288. Christy Mathewson posted a 1.29 FIP in 1908. I’ll be relying on advanced stats a little more in the 21st-century notes as they come into more common usage. FIP didn’t exist during these Martinez years, but these two seasons would feature in Voros McCracken’s initial article on the randomness of batting average on balls in play, which forms the basis for FIP and stats like it. You can make a case that Johnson was the best big-ticket free-agent signing in the history of baseball. 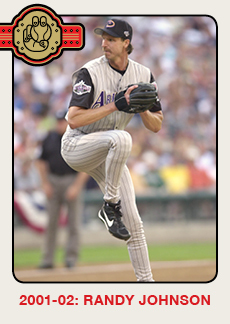 The Diamondbacks signed him to a five-year, $52 million deal before the 1999 season, and Johnson won four Cy Youngs in the first four years. After this piece was filed, of course, Lincecum threw his second no-hitter in two years. #jonahhex. After running through trades and various subsequent swaps, the Halladay deal eventually breaks down in terms of new talent in/out of the organization as follows: The Blue Jays sent Halladay and $6 million to the Phillies and sent John Buck, Wuilmer Becerra, and Noah Syndergaard to the Mets. In return, they got Kyle Drabek from the Phillies, R.A. Dickey, Mike Nickeas, and Josh Thole from the Mets, and Anthony Gose from the Astros. Not exactly a Randy Johnson–to-the-Astros-level score.